How is it that Canada could be dependent on US oil production? 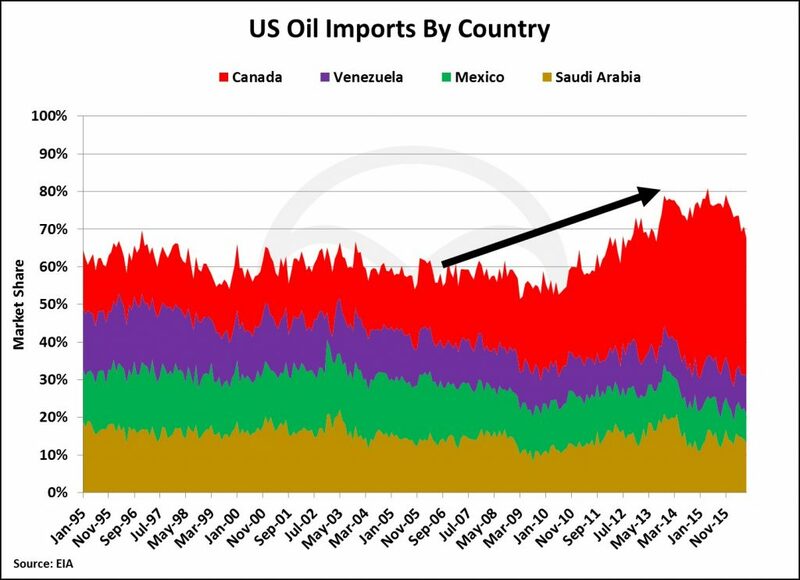 As of 2015, 36% of total US crude imports come from Canada. As Canada continues to exports over 3 million barrels per day of oil to the U.S., what direct role does the U.S. have in allowing Canadian oil to flow southward? Canada is a large exporter of low API crude referred to as heavy crude oil, most of which comes from Canada’s bituminous Oil Sands deposits. If heavy crude has the consistency of syrup, Canada’s Oil Sands bitumen has the consistency of Kraft peanut butter. Heavy oil and bitumen exports from Canada make up 56% of total conventional oil exports. To deal with the lack of fluid-flow of Canadian heavy oil and bitumen, some oil production is partially refined to produce synthetic crude, which creates more fluidity and allows oil to more easily flow into pipelines and receives a premium price in the crude oil market. Another alternative is that producers blend heavy oil and bitumen with a higher API lighter oil that increases the flow of the blended product. One of the common oil products used to blend with heavy oil and bitumen is condensate. When light oils like condensate are blended with heavier oils, the light oil is referred to as a diluent and the blended material is referred to as dilbit. Light synthetic crude is also used in blending with heavy oil and bitumen and the blended product is referred to as synbit. Dilbit consists of 70% bitumen and 30% diluent and synbit consists of 50% bitumen and 50% synthetic crude oil. As Canada’s heavy oil and bitumen production grew over the years, producers’ appetite for condensate grew disproportionately to the domestic supply of condensates. 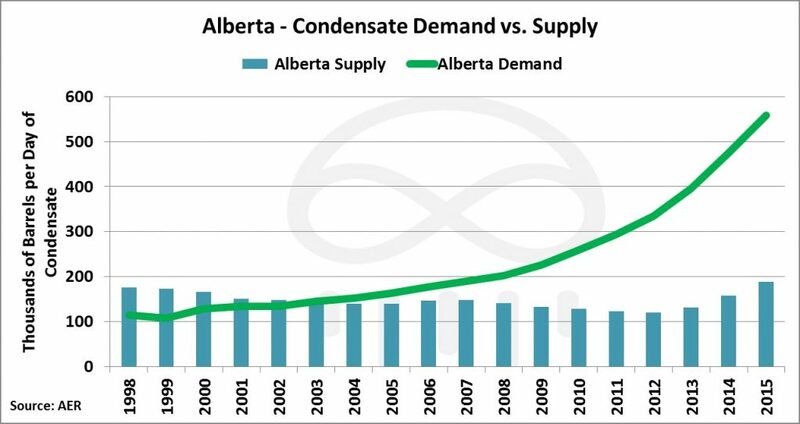 In 2003, Alberta had a 5,000 barrel per day surplus of domestic condensate supply and at the end of 2015 that turned into a 370,700 barrel per day deficit. The US has been filling Canada’s condensate gap with light oil production from US shale formations, specifically in the Eagle Ford. Without US imports of condensate, 1.2 million barrels of heavy oil and bitumen would be land-locked in Canada and unable be moved through pipelines due to its viscosity. As it relates to condensate production and pricing, the U.S. and Canada could not be in a more diametrically opposed situation. The U.S. has too much condensate and it often trades at a discount to US light crude grades (WTI) and Canada is unable to secure enough domestic supply causing condensate to trade at a premium to Canadian light crude grades (Edmonton). 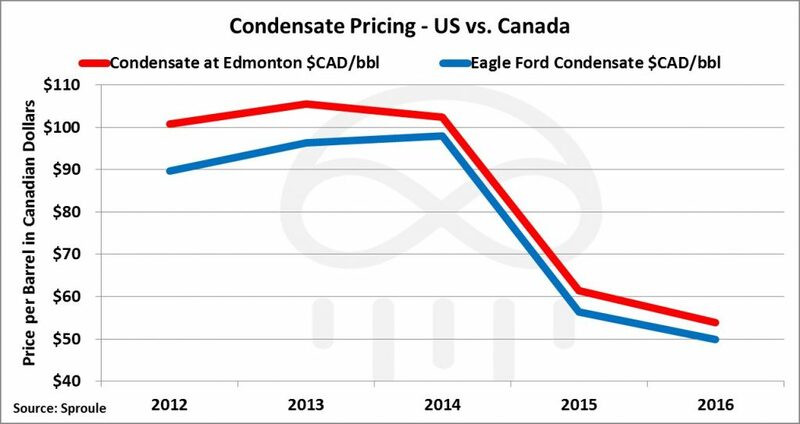 In fact, even when compared in Canadian dollars, Canadian condensate has consistently fetched a higher price than US condensate. Canada Prime Minister Justin Trudeau recently gave the go ahead to build the Trans-Mountain pipeline, which is expected to export 890,000 barrels per day of crude oil through the West Coast to Asia Pacific markets. In the meantime, US producers have remained adamant on opening up their domestic oil & gas production to export markets. These actions by both countries are mutually hurtful as it hits the other side of the border just as hard. The US is the largest refining complex in the world and Canada’s cheap heavy oil pricing relative to other competing crude grades in the West Coast and Gulf Coast has made a lot of profit for US heavy oil refiners. If Canada is planning on exporting 890,000 barrels per day of crude oil to the large refining markets of the Asia Pacific with a preference for heavier crude oils, this will inevitably hurt US heavy oil refiners that benefited from refining cheap Canadian heavy crude. Canada also benefited from landlocked condensate production in the U.S. from shale formations like the Eagle Ford. The discount US condensate traded to WTI made imports of US condensates relatively cheap. As the US starts to loosen export restrictions on light crude oil, exports of condensate and other light oil products have increased by over 700% over the last 2 years. 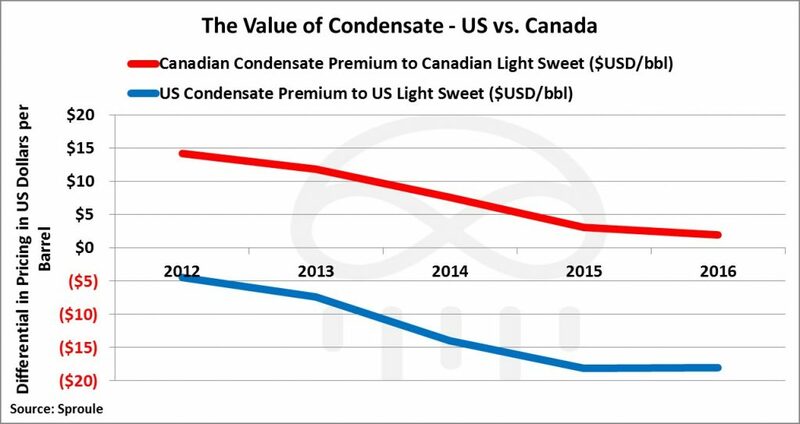 As the US exports more condensate to markets like Mexico and Western Europe, Canadian producers could see US condensates start trading at a premium to WTI and that will affect Canadian heavy oil and bitumen producers’ bottom line. In order to invest in the crucially important condensate production to Canada’s Oil Sands industry, investors are likely to look at traditional investments in condensate rich producers from Alberta’s Montney and Duvernay formations. 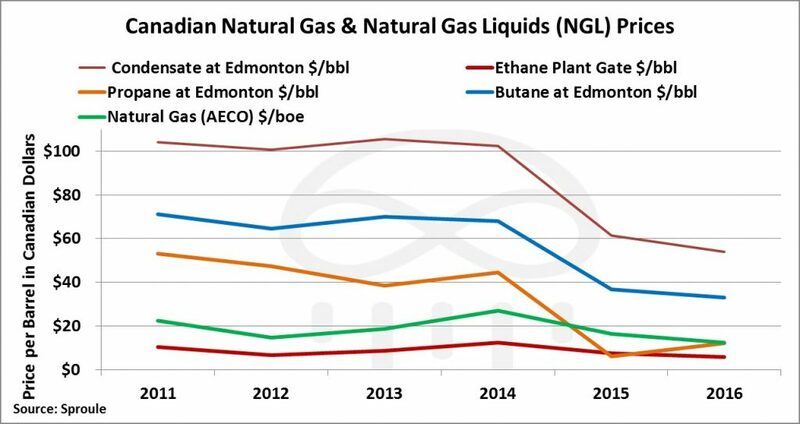 However, not many Canadian oil & gas producers are profitable as natural gas and natural gas liquids, including condensates, are hovering around 5 year lows; this also applies to producers in the condensate rich US shale formations. 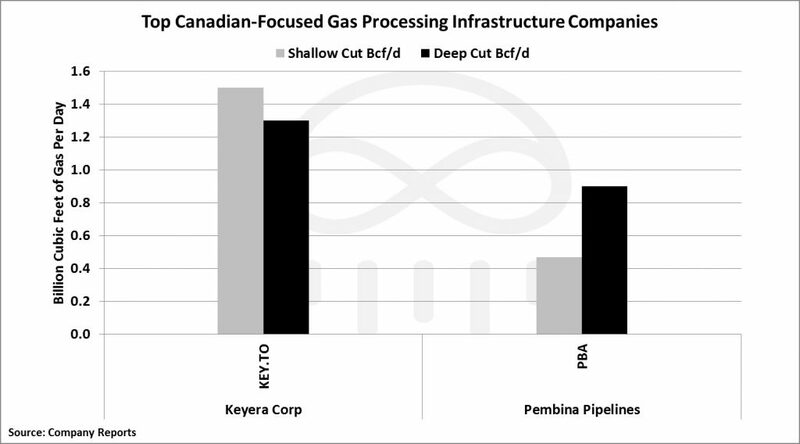 So what companies benefit from the growing flow of condensate to Alberta for blending? Infrastructure. Building out storage, transportation, and processing facilities are key to the expansion of Canadian production of condensates and other light oil products used for blending. 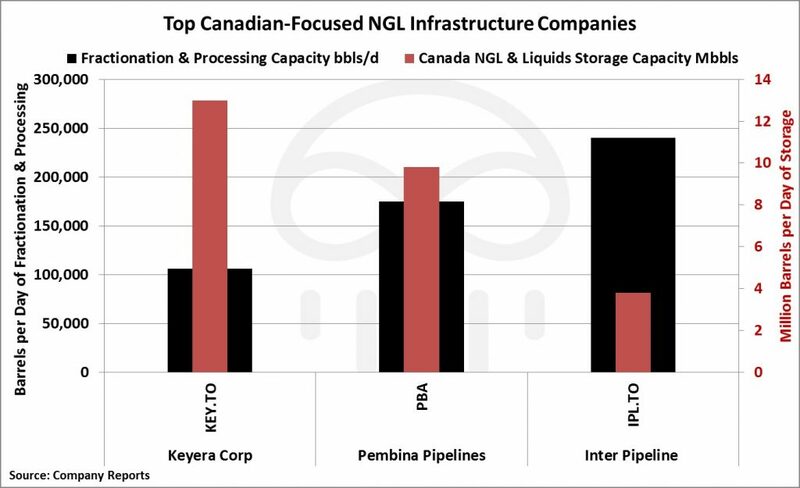 There are a few companies that focus on NGL infrastructure and they control a significant amount of flow of NGL product into and around Western Canada. Infrastructure involved with transporting, processing, and storing NGLs are very important to the growth of the condensate market; however, the extraction of associated condensate and NGLs from raw natural gas production is just as important. Condensates can be produced as a primary hydrocarbon from a well or associated with natural gas production. When natural gas is produced with associated NGLs like ethane, propane, butane, and pentanes (condensates), it is considered “wet” gas. Consumable natural gas must be purified and NGLs must be removed in order for gas to travel through pipelines to the end consumer as “dry” natural gas which is almost entirely made up of methane. Extracting the NGLs out of wet gas is important to adding condensates to the domestic supply in Canada. Processing facilities referred to as deep-cut and shallow-cut gas plants purify wet natural gas by removing NGLs from the gas mix. In Alberta there are 500 active gas processing plants to recover NGLs. 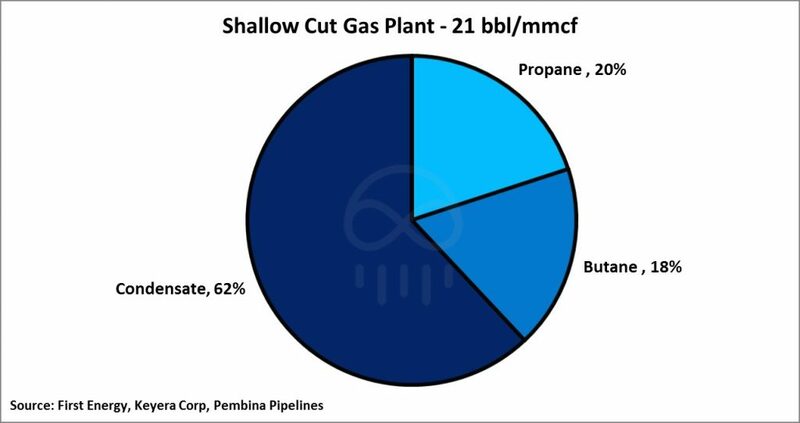 Deep-cut and shallow-cut gas plants extract 50% of the NGLs produced in Alberta and, thus, are very important to securing and growing domestic condensate supply. Depending on the type of processing gas plant, 20-95 barrels of NGLs can be extracted for each million cubic feet of gas processed. Deep-cut facilities can extract over 4.5 times as much liquids from wet gas production as shallow-cut gas plants. 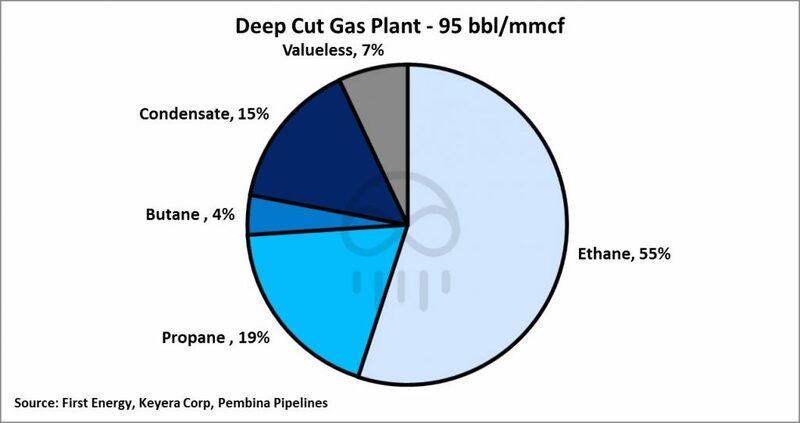 Even though deep-cut facilities extract less condensate on a percentage basis, the facilities extract more liquids from wet gas and, thus, more NGLs and overall condensates than shallow-cut gas plants. 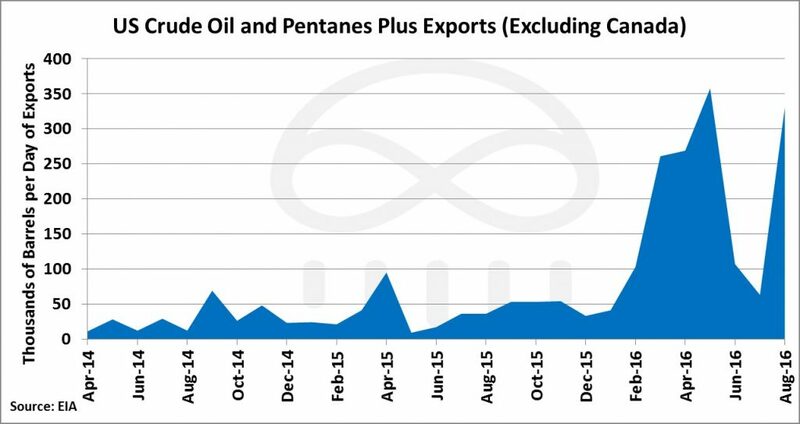 Canada is unable to meet condensate demand with domestic supply needed for blending with Canada’s heavy oil and bitumen production. Securing condensate supply, transporting, processing, and storing condensates from NGL extraction will continue to be important to Canada’s crude oil industry. Those companies in charge of managing light oil products meant for blending with heavy oil and bitumen will benefit the most from Canada’s growing need for diluent. Canada’s heavy oil industry is here to stay and so is blending to get Canadian crude to refining markets in the US and eastern Canada. Canada will continue to rely on the U.S. to allow for the transportation of its own heavy oil and bitumen production; similarly, condensate moving up from US shale formations will continue to rely on infrastructure in Canada to get its product to blending markets.